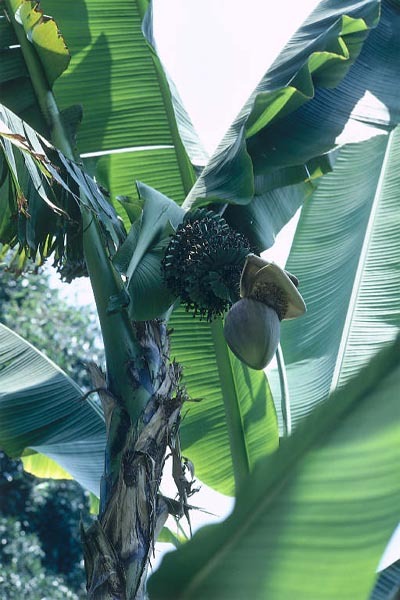 Otherwise known as Japanese fiber bananas, they are cold hardy and can be grown in most any climate. Their fruit is inedible. The nectar of the flowers is sweet and drinkable. Medicinal uses: The roots are diuretic, febrifuge and sialagogue. A decoction is used in the treatment of beriberi, constipation, jaundice, dropsy, restlessness due to heat, leucorrhoea and croton bean poisoning. The leaves are diuretic. Other uses: A fiber is obtained from the leaf stems. Used for cloth, sails etc. The fiber can also be used for making paper. The leaves are harvested in summer and are soaked in water for 24 hours prior to cooking. The fibers are cooked for 2 hours with lye and then beaten in a ball mill for 4½ hours before being made into paper (www.ibiblio.org).